The Great Swamp Watershed Association adheres to high standards of governance and financial management, and we are committed to accountability and transparency. You will need Adobe Reader to view the following documents. For additional assistance, please contact Executive Director Sally Rubin, 973-538-3500, srubin@greatswamp.org. 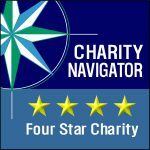 The Great Swamp Watershed Association has achieved a coveted 4-star rating from Charity Navigator for sound fiscal management and commitment to accountability and transparency.